Vales Point coal fired power station. the Greens' Cate Faehrmann inset. The Greens have introduced a Bill to the NSW Parliament which would set pollution limits for coal fired power stations to bring them into line with the rest of the world, and force them to install modern pollution control technology. The Bill was in response to the Environmental Justice Australia (EJA) report that assessed the health impacts of coalfired power stations in NSW, and found that particle pollution from the five remaining coal fi re power stations is causing 279 premature deaths each year (133 related to Vales Point and Eraring Power Stations). The report also fi nds pollution from the power stations cause 233 babies to be born underweight (115 attributable to Vales Point and Eraring) and 361 cases of new cases of type 2 diabetes every year (172 attributed to Vales Point and Eraring). 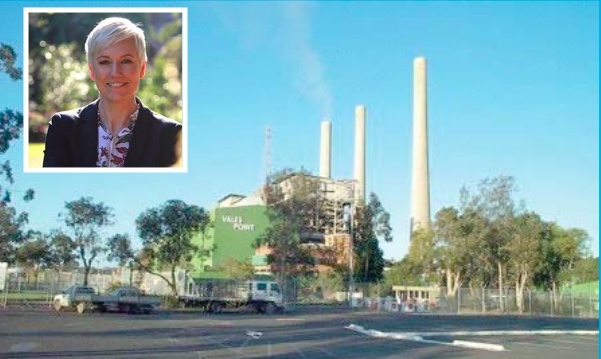 Greens Environment Spokesperson, Cate Faehrmann, said: “This report is proof of just how deadly NSW coal fi red power stations are and it should send shockwaves through the government. “If Premier Berejiklian doesn’t act to force coal power stations to clean up their pollution, then she will be responsible for the deaths of thousands of people,” Faehrmann said. “It is unacceptable that toxic emissions from Australia’s power stations are multiple times higher than what is allowed in the EU, the US and China,” she said. “That is why the Greens have introduced a Bill to the NSW Parliament to set pollution limits for coal fi red power stations which are in line with the rest of the world and force power stations to install modern pollution control technology. “We hope the Government and Labor will put people’s health ahead of the profits of AGL and Origin Energy, and support the Bill when it is debated.” However, on the last sitting day of the NSW Parliament before the March, 2019, election, the Government cancelled all Private Members’ business, so the Bill will not be debated until after the election. The NSW Labor Opposition, on the other hand, has promised a world class system for regulating coal fi red power stations but, according to the Greens, the standards set in its Bill would be the bare minimum required to deliver that promise. Labor would need to win 14 seats to govern NSW outright following the March election. If they win nine seats they would need the help of the Greens and other cross benches to govern, which means they may have to support the Greens’ position on this issue. Currently, there are different levels of emissions for each of the coal fi red power stations in NSW, depending on when the plant was built. These levels have hardly changed since the 1970s and 80s and the standards for emissions are much lower than in the EU, US or China. Power stations are allowed to emit eight and a half times more sulphur dioxide and up to seven and half times more oxides of nitrogen than the EU and China. The Greens’ Protection of the Environment Operations Amendment (Clean Air) Bill 2018 amends the Protection of the Environment Operations Act 1997 to improve air quality and reduce adverse impacts on human health by providing for the standards of concentration for emissions of certain air impurities that are not to be exceeded in respect of coal-fi red power stations in NSW. In her second reading of the Bill in the NSW Parliament, Faehrmann said: “All people have a fundamental right to breathe clean air but right now, because of lax and inconsistent regulation of coal fi red power stations, people on the Central Coast, in the Hunter Valley, near Lithgow and in Sydney, are being exposed to dangerous levels of toxic air pollutants. “In NSW we have some of the worst regulation of pollution from coal fi red power stations in the world and it is killing people,” she said. “Around the world, as emissions control technology and knowledge about the health costs of pollution has improved, governments have progressively lowered pollution limits for power stations to protect people’s health, but not so in NSW. “We know that people who live within 50 kilometres of coal-fired power stations face a risk of premature death, as much as three to four times that of people living further away. “We have a responsibility to do all we can to reduce emissions, at least in line with global standards. “If we do not take urgent action to force the power stations to clean up their pollution then we are directly responsible for the numerous deaths that these toxic emissions will cause. “There is no technical barrier to meeting the standards prescribed in this Bill. “This Bill is a vital part of meeting our obligation to keep the people of NSW safe by taking signifi cant steps to clean up our air,” she said.